Opening on 27 April at Moncrieff – Bray Gallery, Sussex, this exhibition looks at the work of two artists and explores the relationship between drawing and sculpture. Bringing together exquisite wood carvings, relief prints and paintings on wood by Jilly Sutton with stunning sculptures, charcoal drawings and monoprints by Helen Denerley, the exhibition will illustrate how, for both artists, drawing and sculpture are integral to each other. This is the first time that both artists from opposite ends of the country (Devon and Aberdeenshire) have exhibited together. It is also the first time they have both agreed to exhibit drawings alongside their sculpture giving key insights into their working process. Jilly Sutton is renowned for her remarkable skills as a carver and her work is in the National Portrait Gallery. Starting with an often massive piece of fallen timber she works directly into the wood, unlocking the form within but always paying heed to the properties of the material. Jilly draws daily - fluid, linear sketches - drawing is a necessary part of her process of creating a sculpture. It may be just the ‘scribble of an idea’ or a ‘thinking aloud concept’ or it can develop into a proper scale drawing that fits a piece of wood. All Jilly’s drawings tend to be experimental; they are sketches of different angles - the refining of shapes - an exploratory process. Before beginning a sculpture, she executes big charcoal drawings, usually on the floor. Then, with forester's chalk, she draws on the wood. ‘It is a process of look- draw-cut- look again.' Often there is an accidental serendipity to the carving; the cut-away shapes of many of her heads are the result of knots in the wood or areas of rot. ‘As a sculptor, you have to think in 3d all the time’, explains Jilly, ‘especially with the “subtraction” way of working, rather than with “building up” as in modelling. There is only one decision with carving which is to take away or not to take away … I start off with drawings from all angles- but as the shape develops, I abandon the drawings and rely on the work to evolve, to take its form from the wood. Drawing allows me to develop the simplified shapes of my sculpture - often with surface texture’. Jilly’s 2d relief forms made to hang on the wall are an extension of this process. She has developed inventive techniques of jig-saw printing and relief painting on wood. Texture is a key element in all of her work, always exploiting the feel and grain of the wood. Helen Denerley’s captivating 3d creatures, made using recycled materials, have an international following. Helen begins her extraordinary pieces with the head, hanging it from a beam so that she can get it at the right height; the heels come next and she gradually fills in the remaining form, somehow describing living muscles, sinew and movement from the inanimate metal. Her sculptures are linear, welded scrap metal coached into graceful curves and sinuous shapes which suggest as much by what they leave out as what they describe. Helen draws daily, sometimes huge life-size charcoal drawings pinned to the walls of her studio. She has been exploring the shape and contours of a Limousine bull, distressed by the way creatures are manipulated for breeding purposes. This has led to a series of monoprints which reference back to the wild bulls of ancient cave paintings. 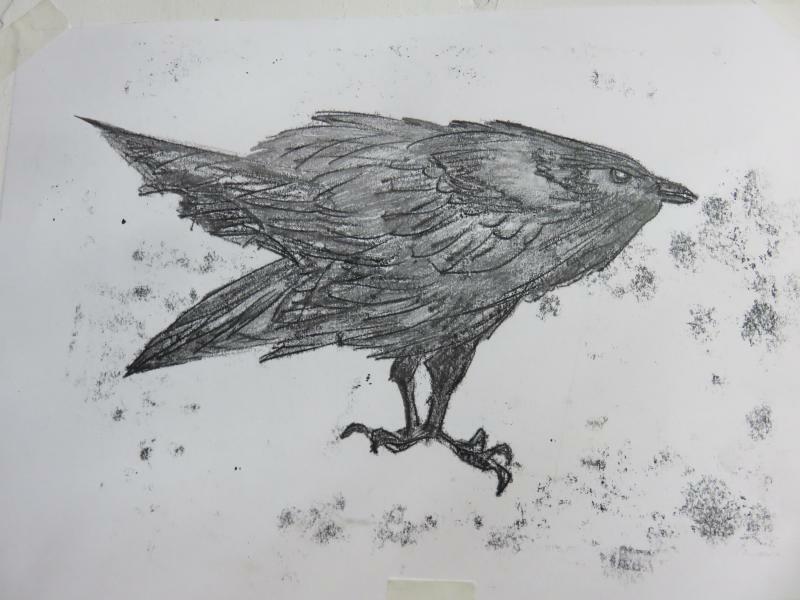 A raven has taken residence on Helen’s isolated farm in Aberdeenshire; his spirited company is caught on paper. Such drawings may or may not be translated into sculpture but they are fundamental to her creative process. 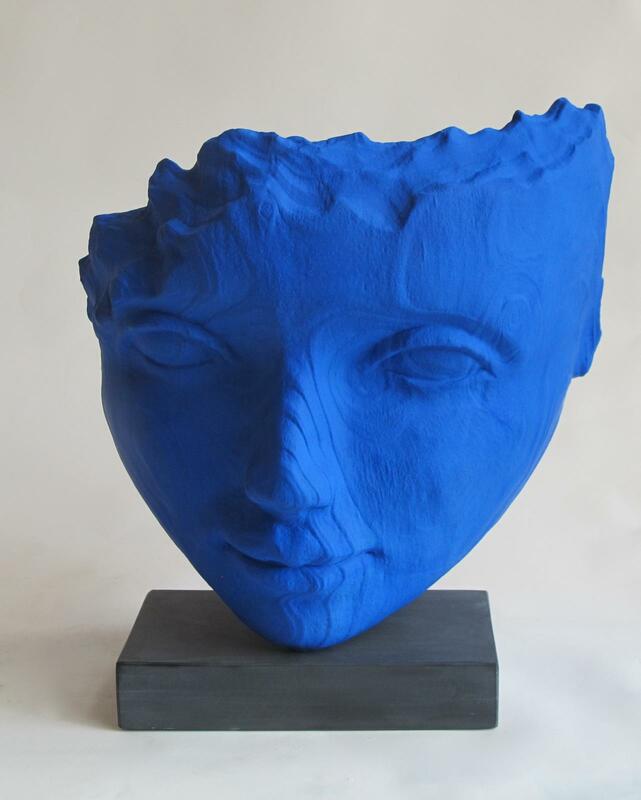 Jilly Sutton and Helen Denerley: Sculpture & Drawing opens at Moncrieff – Bray Gallery on Saturday 27 April (until Sunday 26 May). The Gallery is open Wednesday – Saturday, 11am – 4pm, and on Sunday between 11am and 1.30pm. All work is for sale.